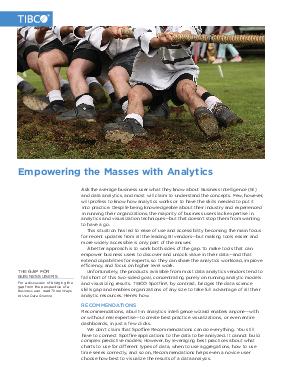 in running their organizations, the majority of business users lack expertise in analytics and visualization techniques—but that doesn’t stop them from wanting to have a go. This situation has led to ease of use and accessibility becoming the main focus for recent updates from all the leading BI vendors—but making tools easier and more widely accessible is only part of the answer. Download this whitepaper to find out how.